Politics is often about compromise and inevitable conflict between competing interests. Sometimes an innovation or two comes along that gets rid of the issues that created the conflict. For over 20 years, scientists from Humaxx, and parent research and development company, Arctech, have perfected and pioneered the biotechnology for the conversion of coal into natural gas and the manufacturing of humic substances into environmentally safe solutions. 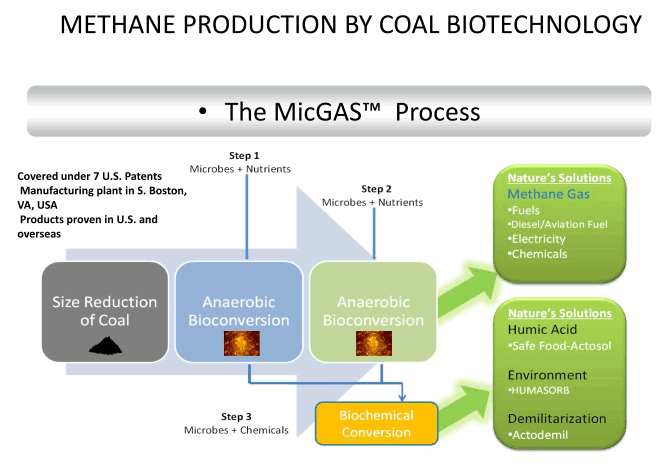 MicGAS is a hydrogen-rich clean methane gas (CH4) produced from coal by specially engineered microbes. 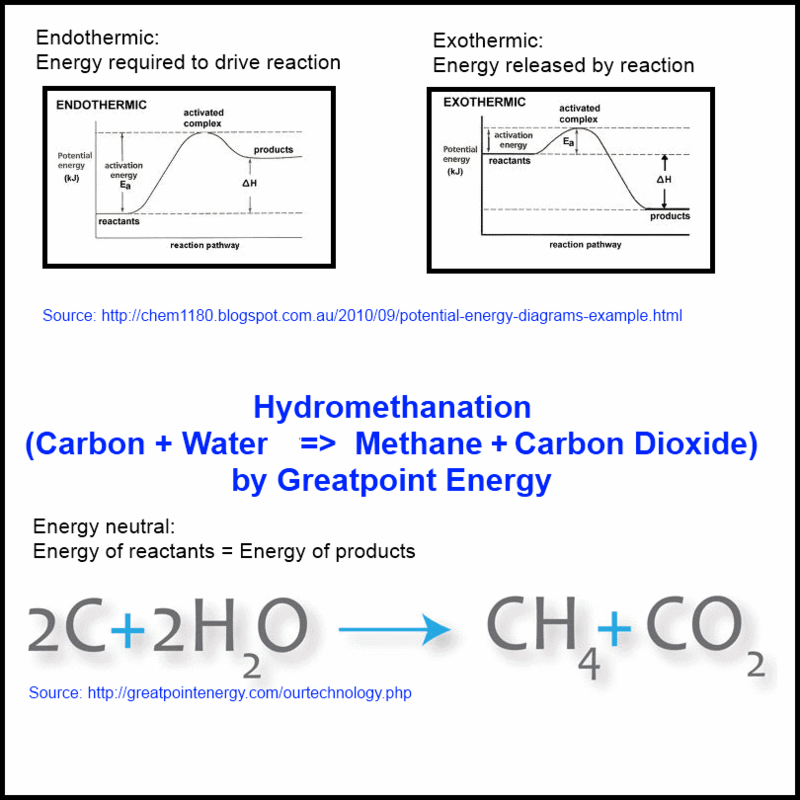 Gas composition ranges from 60-80% methane and remaining carbon dioxide (CO2). Higher rank coals produce more methane enriched gas than lower rank coals. MicGAS can be utilized for heating, power generation, upgraded by removing carbon dioxide to natural gas generally 90%+ methane. Commercial and environmental significance of MicGAS. Through its development of the Arctech Process, we have continued to substantially improved efficiencies and production techniques associated with MicGAS production from coal. We know of no other coal gasification technology, in either ex situ or in situ circumstances, that presently claims to successfully gasify coal at near ambient temperatures and without the need for significant costs associated with thermification. This uniqueness presents major opportunities for both reduced carbon footprints and cost efficiencies for “coal gasification” processes. Bioconversion of coal is accomplished by adapting micro-organisms derived from the gut of termites to coal in the presence of other appropriate nutrients. Australian oil and natural gas companies have invested $70 billion in LNG export terminals in Queensland. Australian farmers are concerned that the coal seam gas industry will jeopardise their businesses by polluting water on which they rely. Australian industry is concerned that the export of huge quantities of natural gas with no proportion reserved for domestic markets will damage their commercial viability. Preventing the growth of the coal seam gas industry - desired by Australian farmers - seems to undermine the ability of the oil and natural gas companies to gain a return from the billions of dollars invested in LNG export facilities. This seems an insurmountable obstacle to any solution to the concerns expressed by Australian farmers. Australian coal mining companies have gained approval to expand export infrastructure including the coal terminal at Abbot Point in Queensland. Australian environment protection groups are concerned at the plans to dump dredge spoil during building the coal terminal in the Great Barrier Reef Marine Park. Australian environment protection groups are also concerned at the prospect of substantially increasing coal exports that seem destined to increase global carbon dioxide emissions when climate science advises that this will aggravate man-made climate change. The Queensland State Government is depending on growing coal royalties to support its budget. An innovation developed by a U.S. company converts coal into synthetic natural gas, hydrogen and carbon dioxide. This innovation could be used to provide natural gas for export from coal mined in Queensland and NSW. The LNG export terminals can export this natural gas. The Queensland and NSW State Governments earn coal royalties from the coal converted to natural gas for export. No coal seam gas investment is needed. No investment in the expansion of coal export infrastructure is needed and so there is no dredge spoil to dump in the Great Barrier Reef Marine Park. The Queensland and NSW coal industry faces difficult market conditions due to falling world prices for coal. Mine closures and job losses slow the Australian economy and cut the return on investments made in mining plant and equipment that is now idle. Australian farming is faced with rapidly rising fertiliser prices. Natural gas to be exported through the $70 billion LNG export terminals is expected to cause the price of natural gas to double or triple. Fertiliser manufacturers now use natural gas as a source of hydrogen. This is a major component in ammonia fertilisers used widely in agriculture. The innovation for converting coal into synthetic natural gas can also produce large quantities of hydrogen and this should help keep the price of fertiliser down. The growing use of palm oil in foodstuffs may be contributing to adverse health outcomes throughout Australia's population. The innovations for converting coal into synthetic natural gas - either bluegas or MicGAS - also produces carbon dioxide. This can be used in algae farming to produce edible oils to substitute for palm oil. This provides an opportunity for growth of Australian agriculture - in addition to overcoming the concerns over palm oil. An Australian company has developed an innovative method for algae farming that may be able to be exploited to achieve these positive outcomes. The cost of drilling large numbers of coal seam gas wells is substantial. Either of the newer methods for obtaining substitute natural gas from coal may well be a better investment. Arrow Energy - Surat Basin Gas project. Production wells will be installed progressively throughout the project life starting in 2014 and ending in 2035. It is expected that up to 18 drilling rigs will be used to install the 7,500 wells. Following the completion of drilling, surface equipment such as the wellhead, dewatering pump, wellhead gas/water separator, control valve, metering and telemetry/communications equipment will be installed. Gas-driven electric generators will be required at wellheads to power the dewatering pumps and ancillary equipment until the gas free-flows, after which production wells will be powered by solar panels where possible. Low-pressure gathering lines will be used to deliver gas directly from production wells to production facilities. Medium-pressure gathering lines deliver gas from field compression facilities to both central gas processing and integrated processing facilities.